If Snowden Tries To Get To Latin America, Cuba Could Be Key : The Two-Way The leaders of Bolivia, Venezuela and Nicaragua have said they're willing to give asylum to the "NSA leaker." He's been lingering in legal limbo at an airport in Russia for nearly two weeks. If he tries to get to Latin America, he may need an OK from Cuba to stop there. Former National Security Agency contractor Edward Snowden, who spilled secrets about the NSA's surveillance programs, has been condemned by U.S. officials. But he's been praised by some people around the world. In Berlin this week, supporters carried his picture at a demonstration. Amid requests and offers of asylum in Latin America, Edward Snowden has apparently released documents showing that the U.S. spied on millions of emails and phone calls of Brazilians. NPR's Lourdes Garcia-Navarro tells our Newscast Desk the report, published in the Rio de Janeiro paper O Globo, was co-written by Glenn Greenwald, who has been covering the National Security Agency's programs. "According to documents obtained from Snowden, the paper says both Brazilian companies and individuals were spied on by the U.S.," Garcia-Navarro says. A version of the story also appeared in The Guardian. 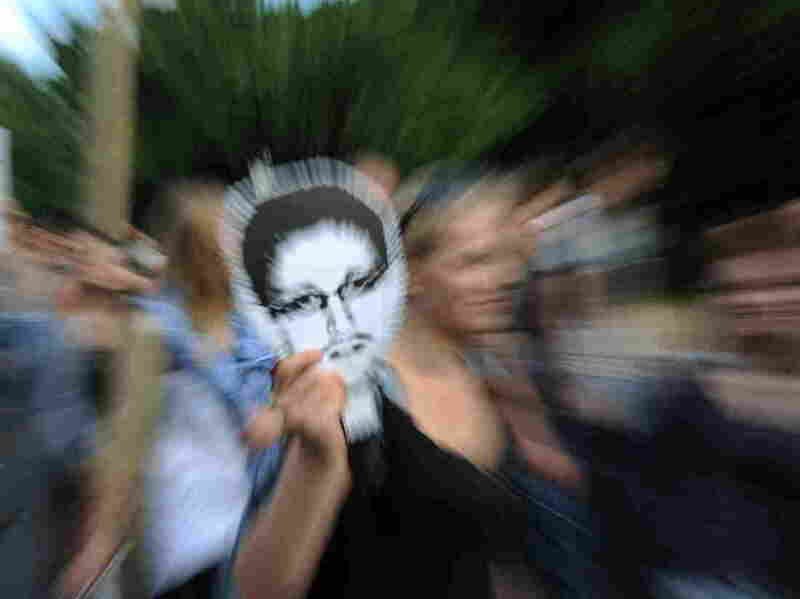 Brazil rejected a request from Snowden for asylum, Garcia-Navarro reports. That brings to three the number of Latin American nations that say they would welcome the "NSA leaker." If Russian authorties give him permission to leave, can he get to either country from Moscow's Sheremetyevo Airport, where he's been lingering in legal limbo for nearly two weeks? "The only 'safe' commercial flight across the Atlantic — one that would avoid U.S. extradition treaties — is to Cuba. Cuba has an extradition treaty from 1904, but the Castro government could chose to ignore it. From Havana, Snowden could connect to Caracas, Venezuela, or Managua, Nicaragua." But according to Reuters, "it is not clear if the Cuban authorities would let him transit ... and there was no sign of Snowden aboard the flight to Havana on Saturday." What's more, "given the dramatic grounding in Vienna of the Bolivian president's plane this week over suspicions that Snowden was onboard, using European airspace could prove problematic." With financial help from his supporters, ABC News adds, Snowden might be able to charter a private plane. It writes that: "Reports last week quoted the cost of a private plane to Ecuador to be more than $200,000 on one of the few private jets that could make the trip without refueling. Similar flights to Venezuela or Nicaragua would presumably be only a bit less." Of course, some nations might try to block a plane with Snowden aboard from flying through their airspace. It's unlikely, though, that they would use force to make a jet land. As President Obama said last week, "I'm not going to be scrambling jets to get a 29-year-old hacker." Morales' plane had to land somewhere in Europe to refuel.